The Iditarod Trail Sled Dog Race is an annual thousand-mile journey across Alaska attempted by dozens of mushers and their teams each year. August, an Alaskan husky, had run the race at least three times, but was now too old. Before he could find a new home and life, however, he was hit by a car and his leg broken. Without surgery for his leg, his future looked grim. That is when Jeannine Armour heard about his plight. She was deeply touched by this dog who, despite his injury, had enormous spirit. She began to raise money for his treatment. It wasn't until after his surgery that Jeannine met August for the first time, but she ended up bringing him home to live with her. "The first time I laid eyes on him, I fell in love," Jeannine says. With the help of her friend Julie St. Louis, Jeannine decided to create a fund to help more dogs like August. 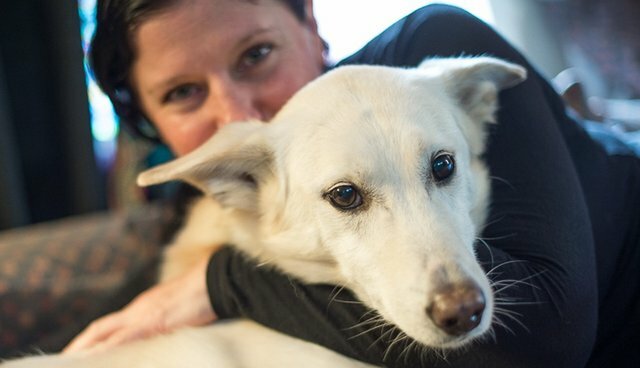 The August Fund has now become a foundation that provides veterinary care and loving retirement homes for other racing sled dogs from Iditarod, Yukon Quest, and professional sprint kennels. Hundreds of dogs participate in the Iditarod annually, and many more run in smaller races throughout the year, but what happens to the dogs that are too old or injured to keep racing? The August Foundation for Alaska's Racing Dogs helps dogs like August go "from the trail to the couch." Last fall, Jeannine and August were photographed by Jane Sobel Klonsky for Project Unconditional, a series that captures the special connection between people and their older dogs. In an interview with Jane's daughter, the filmmaker Kacey Klonsky, Jeannine tells of the joy of watching August just sleep "without a care in the world." August had spent his entire life as a racing sled dog, so Jeannine had to work to gain his trust. "It can be a hard working life for racing dogs," says Jeannine, "but these Alaskan huskies live to run." She remembers the moment when August first seemed to think, "Wow, like you're my mom ... this is what the rest of my life is like!" To learn more about The August Foundation for Alaska's Racing Dogs, visit www.theaugustfund.com. This video is part of "Unconditional Stories," a collection of videos by filmmaker Kacey Klonsky that accompanies Jane Sobel Klonsky's Project Unconditional photo series. Follow Jane's journey on Facebook and watch more of Kacey's videos at: www.projectunconditional.info/videos/.